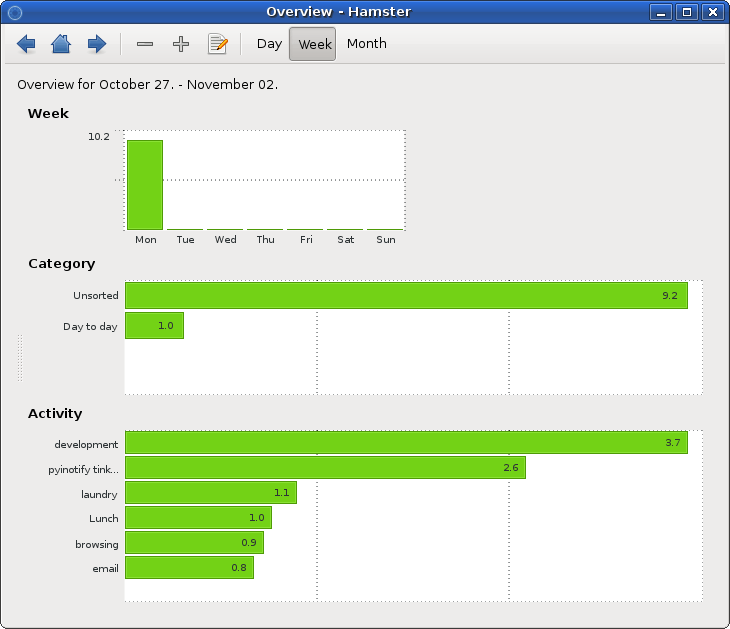 In GNOMEe 2.24, hamster-applet will be included by default. When I use it, I love it. I should use it more often. Managing browser tabs needs its own methodology, like GTD: Every week, go through your open tabs and close as many as you can. I don’t actually need to read that article. Not interested in this, any more. etc. Clearly, I fail. >.< Restoring this session of 20 tabs brings Firefox up to 80MB, right away. Most of my current tabs are about different programming things: various references, tutorials, articles… as well as a tab to feedburner – for some reason, I’m addicted to looking at my blog’s meagre statistics. It’s fun! Side Note: One thing that’s pretty cool, that can help minimize the tabs open for Python reference, is the Python sidebar. If there was only a pyGTK section in the sidebar….